A month ago, New York City got its first permanent cat cafe, Meow Parlour—and, well, it's pretty popular. Currently, every single time slot (there are 20 per half hour) is booked through the end of February and well into March. People, it seems, love pets. Especially when they're not fiscally or excrementally responsible for them. But maybe you're more of a dog person than a cat person. The simply named forthcoming The Dog Cafe in L.A. is looking to address that need. Founder Sarah Wolfgang spent time volunteering at animal shelters in Korea, where dog cafes full of pure-bred, puppy mill-produced dogs are popular. She's hoping to combine the overseas trend with her charitable spirit at the first American dog cafe. As is the case with Meow Parlour, all the animals at The Dog Cafe will be available for adoption. "The Dog Cafe’s mission is simple. We want to provide a second chance for shelter dogs that are often overlooked," Wolfgang told LA Weekly. "The Dog Cafe is going to put a spin on the way people adopt by totally reinventing the way we connect with homeless dogs." 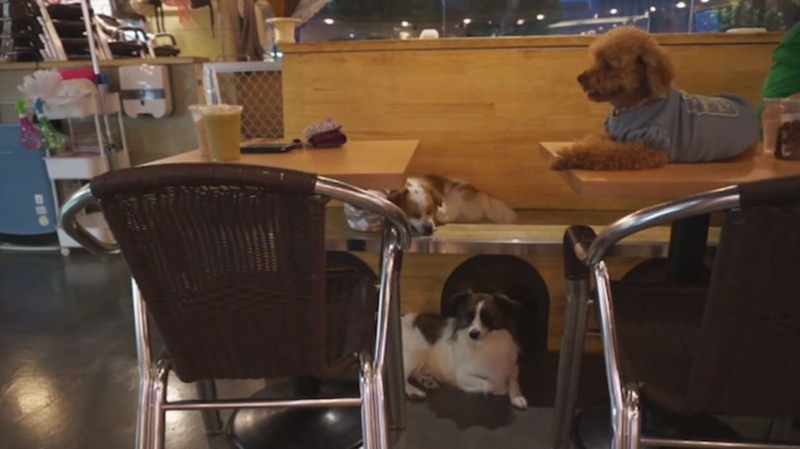 Since a big group of dogs probably doesn't mix well with unattended food, The Dog Cafe will only serve tea and coffee, and you'll have to pick up your beverage from a drink service counter away from the "dog zone," in accordance with L.A. Health Department regulations. From there, though, you're free to take sip some coffee while cuddling cute puppies. And even if you can't adopt, you'll be aiding pooches in need by patronizing the cafe—the coffee served will come from Grounds & Hounds Coffee Co., which donates 20 percent of its profit from each purchase to a local shelter. Now through February 5, the Dog Cafe's GoFundMe is attempting to raise $200,000 to support the cafe's operating costs. Let this video convince you to donate because, even if you're an adamant cat person like myself, you have to admit those are some cute dogs.